“Yes, how it going? We are here to carry equipment to ‘Medical Supplies. '” The buzzer had a light that changed from red to green and unlocked. “Alright. Meetcha there. Wait inside.” Jane opened the door. “Thanks!” They pushed both fully-loaded carts of boxes at about eye level into a small room with a semi-open window, a clipboard sitting on the windowsill, and a metal chair against the opposite wall. A skinny security guard appeared behind the glass. They arrived as Jane finished her laugh, stopping to have a brief chat with the man that signed the paperwork and received the equipment. “I know what you mean! They’ve just been doing terribly!” “Yeah! They need to get more big players, like me!” Jane drowned out the sports conversation by idly observing the large supply room, resting her attention on a dated computer in the corner. They left out through the same receiving room, returned their badges, loaded up their carts, and hopped in the truck. Sources: My professional experiences. A Samoan name generator provided Mariota, so, of course, what is Super in Samoan? Sili’s style of speech was translated into Samoan and back a few times; no offense intended. Inspirations: There have been times when I’ve done non-technical support work because I’d get sick of some aspects of the work. I’ve always found myself back in technical roles. Glutton for pain, probably. 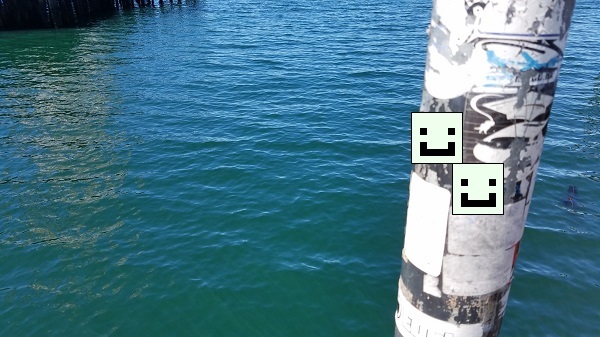 Photo: A graffitied pole nearby the water.